To what extent does cost, particularly relative cost among comparable institutions or destinations, factor in an international student’s choice of where to study? This is no small question against a context of increasing competition across the international marketplace and during a period in which many institutions will be forced to increase international tuition rates in response to rising costs or other financial pressures. One striking case of rising relative cost is the Australian higher education sector as a whole, which has become dramatically more expensive for international students in recent years. Certainly, the high costs of education for international students in Australia are a significant barrier to the country’s goal to bolster the international education sector to the high levels seen at the turn of the century. We wrote in March about the International Education Advisory Council report, “Australia – Educating Globally.” Commonly referred to as the Chaney report, it estimated that “the most likely growth path would see Australia hosting around 520,000 students in 2020,” noted that “cost” is among the top three main drivers for international students. The report also provided a chart (which we have included below) showing that from 2009 onwards, Australia has lost its historic price advantage over other leading competitors such as the US and the UK. Since that notable turning point in 2009, Australia has become increasingly more expensive due to a combination of tuition increases and changing currency exchange rates. The Australian dollar has appreciated more than 56% against the US dollar since 2003 and such currency shifts touch all aspects of student spending from tuition to costs of living abroad. 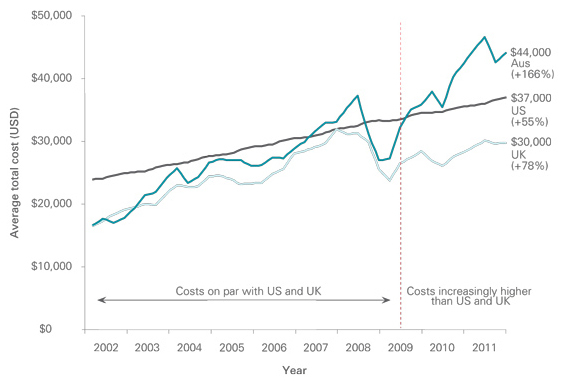 Even so, the 166% cost increase observed for Australia compares to a 55% increase for the US and a 78% increase for the UK over the same period. Tuition is going up virtually everywhere, including the US, where in 2012/13, according to the College Board, the average cost of tuition at a private, nonprofit college was US $29,056, marking a 4.2% increase over 2011/12. To offset sticker shock, there is widespread tuition discounting going on in the US: according to the National Association of College and University Business Officers (NACUBO) in 2011/12, the average discount rate for first-time, full-time freshmen hit 45%, and for all undergraduates, 40%. What about that next tuition increase? Tuition for domestic and international students alike continues to move upwards even as competition increases across the education sector. This reflects a strong underlying pressure to address rising costs and other challenges in the institutional business model. Moreover, there are some who would argue that higher tuition is only a serious problem if other elements of an institution’s brand value are not intact. Blogger Mr Gervas Huxley in The Telegraph makes an analogy between academic journals and higher education institutions, noting that “journals with an established reputation [can charge] prices that far exceed publication costs without fear of losing out to competition from cost-cutting rivals” – as can universities and colleges. The trick of course, is that you have to be an established brand to withstand the price-cutting tactics of the competition. If you are not an established or elite brand, there are other strategic options for pricing and positioning. “Transformers” – Private providers and new entrants that “carve out new positions in the ‘traditional’ sector and also create new market spaces that merge parts of the higher education sector with other sectors, such as media, technology, innovation, venture capital and the like. We also recently wrote about the growing importance of certain factors to international students when it comes to study abroad decision making. This reinforces another key observation from Australia’s Chaney report: that a strengthened value proposition for students – including prospects for employment and immigration – is an important counter to the effects of higher relative costs of study. This entry was posted in Australia, Australia/Oceania, Higher Education, Most Popular, North America, Regions, United States, Vocational and tagged student mobility, tuition fees, postgraduate student recruitment, TAFE, student recruitment.